﻿ What If They Lied (just a little)? 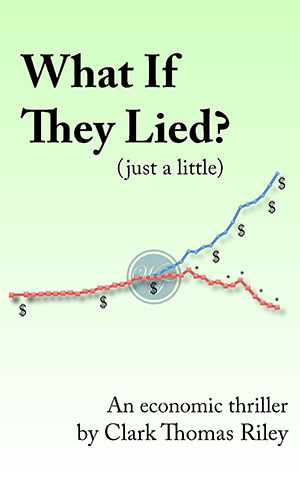 About What If They Lied (just a little)? Prosperity is roaring. Stock markets have not seen three down days in a row for two years. GDP sets new record highs with each report. National unemployment is at record lows. By every national measure, these are happy days. Food pantries and soup kitchens report new records as well, and not just the perennially poor. States are exhausting their unemployment funds. Factories are closing and those states with effective monitoring programs report rising unemployment. Local governments are closing recreation centers and implementing hiring freezes to avoid tax increases. Out of public view, cities and counties are even replacing their 911 workers with new robotic call center machines. At some point, the disconnect between the national picture and the local can no longer be reconciled, and the blame games begin, soon descending into national violence. How long before the true picture becomes clear? When the truth is revealed, how resilient are we? What If They Lied (just a little)? chronicles a time of deception, collusion, discovery, integrity, and redemption. Do you believe in our economics numbers? Do you believe the authorities? What if they lied (just a little)? Baltimore author Clark Thomas Riley has written and published non-fiction since the 1970s in support of careers in college at The University of North Carolina, Chapel Hill, the United States Navy, Graduate Studies at The University of Chicago, biomedical research, and information technology. He began writing fiction in 1994 and has five novels finished to the first draft level. What If They Lied (just a little)? is his first novel to be published. Following this work will be a pioneer romance, a medical mystery, a spy novel, a liberation adventure, and a commentary on building the twenty-first century hobby greenhouse. Other interests include teaching Sunday School, growing and speaking about orchids, publishing services, teaching, and social activism. The author can be reached at ClarkTRiley@gmail.com, where you can participate in a moderated discussion of What If They Lied (just a little)?. This is a moderated discussion. That means that the author is responsible for what is posted and has the sole right to accept or reject comments and questions. Anything designed to start a flame war or put someone down will NOT be posted. That said, I will try to post every serious question or comment sent to ClarkTRiley@gmail.com and will, to the best of my ability answer questions and share constructive feedback. By default, I will identify participants by initials and geographic region, if known. If you'd prefer, provide a handle and any other identity preference. My writing started in 2008. The goal was a party-independent, time-independent story. I picked this time — then in the future — so that the days of the week and dates would be consistent.